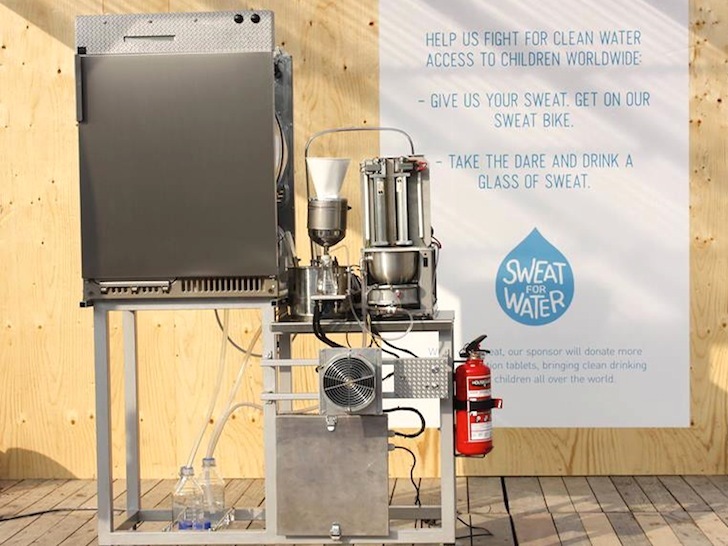 Swedish Machine Turns Sweat into Perfectly Good Drinking Water! You probably never thought you could go to the gym and then rehydrate at the end of a grueling session with your own sweat, but that possibility now exists. Inspired by NASA astronauts, who are required to recycle everything during long journeys out in Space, Swedish designers built a Sweat Machine that squeezes out the water from post-workout clothes and makes it fit to drink! The Deportivo PR company teamed up with UNICEF to develop the project in order to spotlight the dire scarcity of water that many people around the world confront, Stefan Ronge, chief creative officer, told Discovery News. Apart from a high-tech filter developed at the Royal Institute of Technology in Stockholm, the machine is actually fairly simple to make with basic parts – including a regular clothes dryer. A pile of sweaty clothes goes into the dryer in order to spin out the water. This is then exposed to UV light before it passes through the high-tech filter to remove salt and bacteria. And lastly, the water is funneled through a coffee filter to remove clothing fibers. Some inventions are just useless. How many liters of sweat can you collect? If it was meant to turn sea water into drinking water, then humanity would have been grateful to it. If ONLY it produces filtered & organic Water, process & product is Vegan, does not destroy delicate let alone non-delicate clothes, Solar Powered, Made from Recycled & Biodegradable Materials & thus made from such Parts, & made COMPLETELY in The USA & from USA employees, then I am all for it. How much energy does it take to run a clothes dryer and UV sanitizer?